​​​Upcoming events are listed below. See the "ALL PAST EVENTS" tab for lists of past events sorted by category. 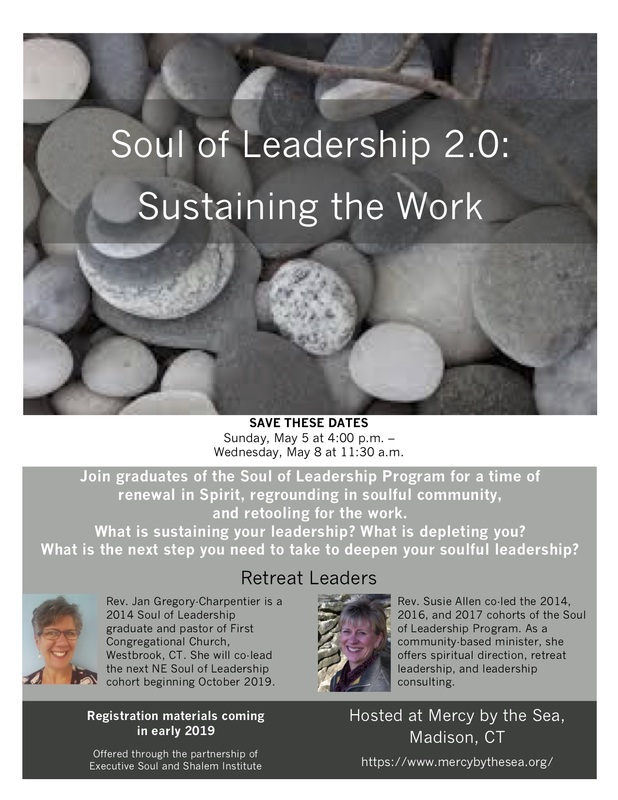 "Soul of Leadership 2.0: Sustaining the Work." Mercy by the Sea, Madison CT. Rev. Jan Gregory-Charpentier and Rev. Susie Allen. May 5, 4:00 pm and May 8, 11:30 am. Retreat. "In the Footsteps of St. Francis and St. Clare: A Pilgrimage to Assisi." Assisi, Italy. Margaret Benefiel and Chuck McCorkle. May 7-17, 2019. Pilgrimage. Apply here. "Soul of Leadership." Margaret Benefiel. 3-6 June. Woodbrooke. Birmingham, England. "Soul of Leadership Reunion." Margaret Benefiel and Lynne Sedgmore. 6-7 June. Woodbrooke. Birmingham, England. "The Soul of Leadership." Margaret Benefiel and Tony Mazurkiewicz, 18–month program beginning in June 2019. Four residencies in the greater Washington, DC area. (June 24-27, 2019; Jan 6-9, 2020; June 15-18, 2020; Jan 4-7, 2021). Apply here. "The Soul of Leadership." Margaret Benefiel and Jan Gregory-Charpentier. 18–month program beginning in October 2019. Four residencies in the greater Boston area. (Oct 21-24, 2019; May 4-7, 2020; Oct 26-29, 2020; April 5-8, 2021). Apply here.